Oussama Diab (1977 - ), 'Human Being', 185 X 250 cm. Mixed Media on Canvas, 2012. DUBAI.- From September 17 until October 30, Ayyam Gallery DIFC is presenting a solo exhibition of Palestinian artist, Oussama Diab. In the Name of Freedom features a selection of his latest paintings. Oussama Diabs exciting Pop and graffiti-inspired expressionistic canvases employ symbolist interpretations of current events and concerns. Candor, yet playful, this juxtaposition reflects a duality prominent in all of Diabs work. All featured on nondescript patterned backdrops, the subjects take center stage. Diabs paintings incorporating balloon-headed figures and darts playfully depict fate, violence, and the ease some have in taking life. 'New Pieta' reconfigures Michaelangelo's Pieta sculpture. While beautifully and accurately depicting Michaelangelos masterpiece, Diab has added a new level of interpretation and propagandized the work with the placement of a keffiyeh around the head of Christ. In the triptych 'Contrast', a fully clothed woman has her head covered with a scarf and is blindfolded while on either side of her, as if enjoying spa treatments, two women have their eyelids covered by cucumber and kiwi slices and their hair covered with towels. Humor enters the work with the carefree idea of a spa and fruit, yet it is the simple difference of circumstance that defines whether these women are engaged in a free act or constrained by it and the reference is that all three women are imposing blindness upon themselves. Perhaps the most challenging message is carried by Diabs 'Human Being'. 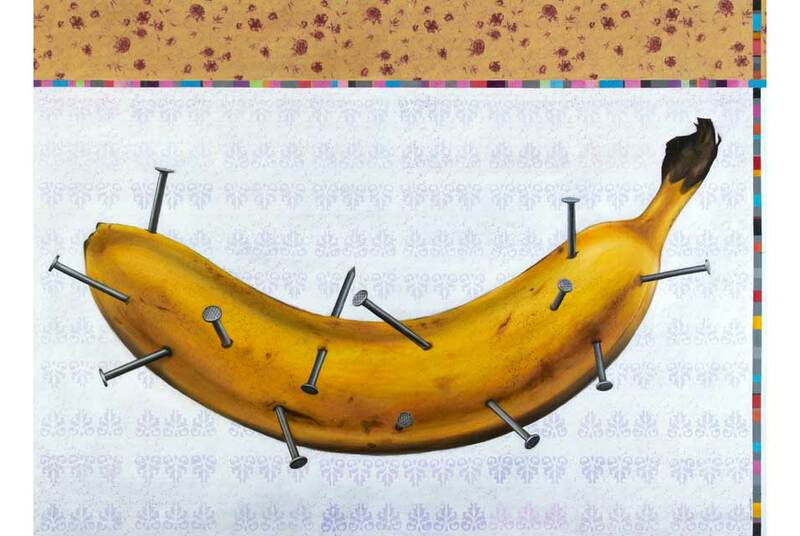 Depicting a banana pierced throughout with nails on a light-hearted floral background, 'Human Being', denotes the crucifixion, pain, and temporal issues, leading the viewer to ultimately question his own mortality. Born in 1977, Palestinian artist Oussama Diab has quickly gained rank within the Middle Eastern art scene. A graduate of the Faculty of Fine Arts, Damascus in 2002, he has been featured in solo and group exhibitions throughout the region and has been honored for his work with several awards from the distinguished Young Artists exhibition in Syria. Since his debut show with Ayyam Gallery Damascus in 2009, his work has continued to impress critics, while several successful sales at Ayyam Auctions have garnered the artist great recognition among regional art lovers. Since opening in 2006, Ayyam Gallery has become one of the most prominent galleries in the Middle East with four exhibition spaces throughout the region, notably in Damascus, Beirut, Dubai, and two upcoming spaces in London and Jeddah. Ayyam Gallery proudly represents some of today's most recognized emerging and established Arab and iranian artists.